Alexander Grant — English ballet dancer. In 1946 he joined the London Sadler's Wells Ballet, later called the British Royal Ballet, where for many years he was one of the best performers of grotesque and character parts such as Petrushka or Feja Karahasov. 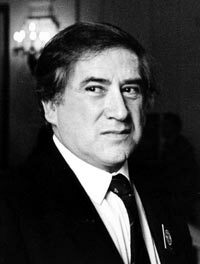 Alexander Grant worked with the choreographer L. F. Mjasin ('Mademoiselle Ango — music by Lekok 1947) and collaborated closed with the famous British ballet artist F. R. Ashton. So, right from the start he was surrounded by the first performers of many of Mjasin's stagings of Cinderella, Daphnis and Chloe, Undina, Persephone, Sleep, Jazz Calendar, Mysterious Variations, The Moon in the Village, and of course La Fille Mal Gardee where the part of Main was adapted to his artistic and theatrical individuality. Between 1971 and 1975 Grant took over staging from Ashton who was then directing Ballet for All. In 1976 he became director of the National Ballet Company of Canada (Toronto). In 1961 he toured, the USSR with the Royal Ballet.